The Assignment Manager app is designed for students in high school or college to manage classes, assignments, and deadlines. The app utilizes progress indicators and color coding to indicate when due dates are approaching. Students can add new assignments, update existing ones, and track completion progress with the Harvey Ball image. Manage all your classes. Go to the Classes view and add classes as needed. When you select a category, a spreadsheet formula adds a link to an image related to that class category (Match, Science, English, etc). Add and update assignments to a class. In the assignment menu, you can add a new assignment that is connected to one of your courses. When you add the assignment, you can define the due-date and a spreadsheet formula will keep track of how many days are left to deliver the work. In the Assignment menu, you'll also be able to see the class category the assignment belongs to and how many days are left to the due date in the main menu. 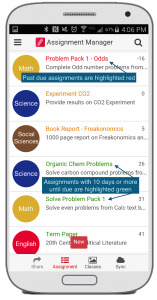 When you tap on any of the assignments you'll get to see more details like progress, due date, course name (we use Course and Class interchangeably, this is a nifty tool for both high-school and college). 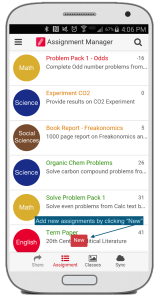 Finally, you'll be able to flag an assignment as completed and also track progress. The app will also give you visual cues on assignments that are close to due date and past due by changing the color of the name of assignment (closest to past-due makes it red). If you mark an assignment as complete, then the assignment will be grayed out. Ref-- We created two tables for this app: one for the general School Work Manager and one just for Courses. 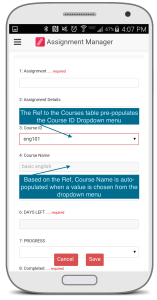 When adding a new assignment, we wanted to be able to choose from a dropdown menu of courses which we were able to accomplish by referencing the Course ID in the School Work Manager table to the Course ID field in the Course table. Slices-- We created a set of slices to show the progress status of assignments. First we specified three slices based on the number of days left to the due date-- one for past due, one for 5 days left until due date, and one for 10 days left until due date. Conditional formatting-- We also used our slices to create conditional formatting rules over the assignments in our app. For example, we created a rule that changed the assignment name color to RED and pointed it to the slice "Past Due" so every assignment that matches the conditions for past due (the date of the deadline is greater than today), turns red. Likewise-- assignments with 10 or more days left get are highlighted GREEN, and so on.